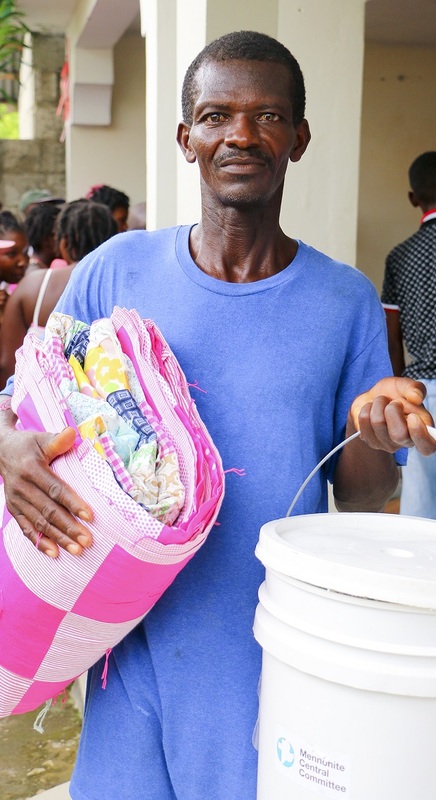 Osa Jonmarits and his family were awakened in the middle of the night as water rushed into their mud-and-stone house on the mountains of La Chapelle, Haiti, and covered them in their beds. Placing their two smallest children on their shoulders, Jonmarits and his wife waded with their other two children through waist-deep floodwaters in places, as they walked uphill for several hours in pouring rain to get to a safer location. Their story is not unique. 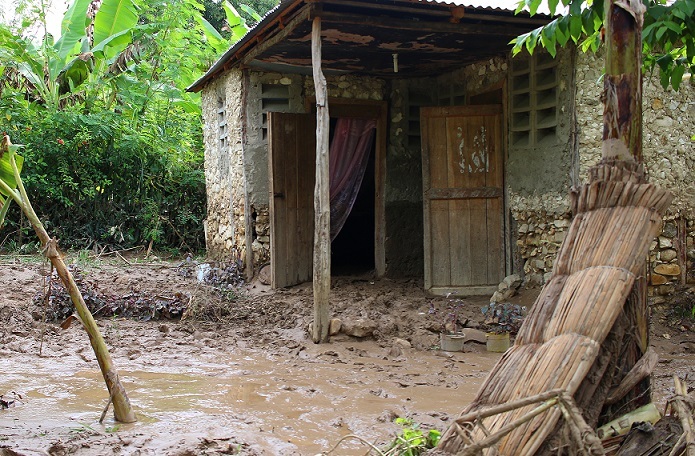 La Chapelle is a commune (like a township or municipality), located in the Artibonite Department, which had one of the highest concentrations of rainfall in the country within a very short time, says Rebecca Shetler Fast, an MCC representative in Haiti. The rainfall led to devastating flash floods because of the Artibonite’s mountainous topography and narrow ravines. “These strong and churning flood waters meant that many families put children on rafters, on roofs, climbed trees or simply had to stand with children on their shoulders outside in the rain through the night until the waters began to recede in the morning,” she said. The Jonmarits family returned to their home the next day to find walls crumbling, livestock dead and their surrounding garden and fruit trees swept away. 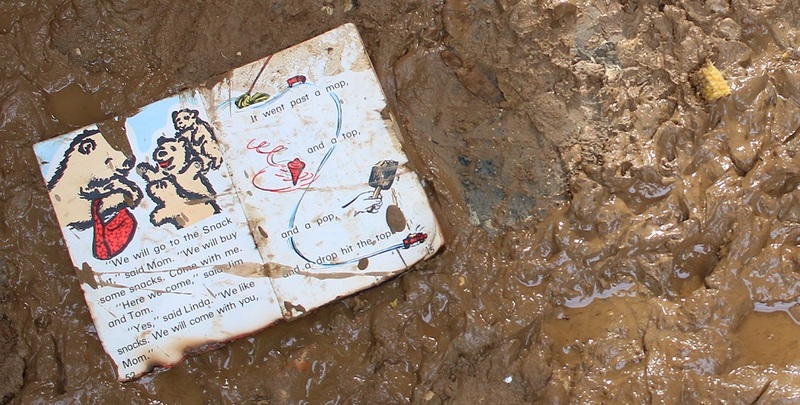 Most of their belongings had been destroyed or washed away, including school materials and uniforms for their children—a huge cost to the family and a necessity for attendance. Less than 48 hours after Irma passed, MCC staff conducted its first distribution of comforters, water purification tablets and relief kits that contain hygiene supplies for a family of four. The Jonmarits family was among 90 families that received supplies that MCC had pre-positioned in the capital of Haiti, Port-au-Prince. MCC also is preparing for a food security response for families in and around La Chapelle, including the distribution of food assistance and seeds, so people can replant their gardens. The initial response was organized after an assessment team, led by Paul Shetler Fast, also an MCC representative in Haiti, reached La Chapelle to assess the damage. “Without going to these communities in person, wading through those rivers and talking to people face to face, you wouldn’t hear their stories and we wouldn’t be able to help,” he said. MCC area director Bonnie Klassen has been in Cuba with leaders of the Brethren in Christ church since Irma hit. They are assessing the damage and planning a response. Klassen said Cuban people she has met are demonstrating a lot of solidarity.